An indispensable item for traveling or backpacking in bug infested regions. 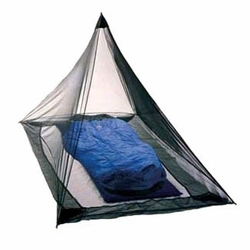 Sea to Summit Mosquito Net shelters are small, light and compact. Asymmetrical center hanging point gives practical headroom and uses less netting than shelters with a center hanging point, so our shelters are lighter and more compact.